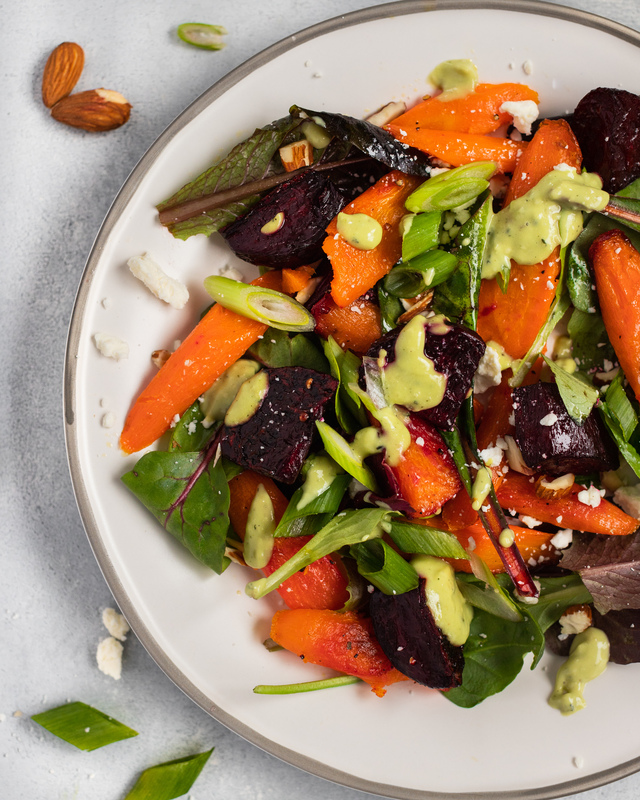 Roasted Beet & Carrot Salad with Avocado Dressing | Eat. Love. Namaste. Keeping the salad game strong in the winter can be challenging because our bodies crave warm, comfort food. Well, I’m excited to share a new salad that is perfect for this winter season! 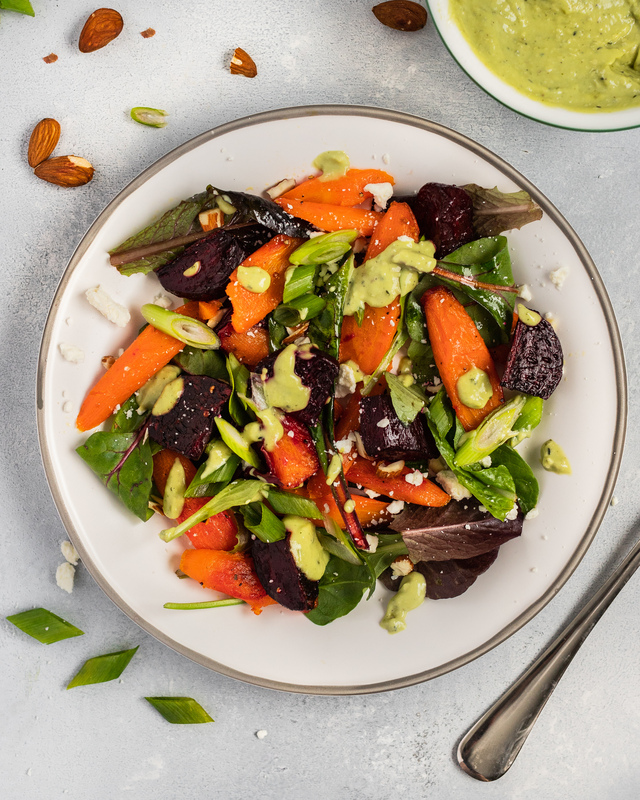 It is loaded with roasted beets and carrots and topped with a refreshing and nutrient-packed avocado dressing! This would be the type of salad you would be ordering if you were out to eat; it’s that good! 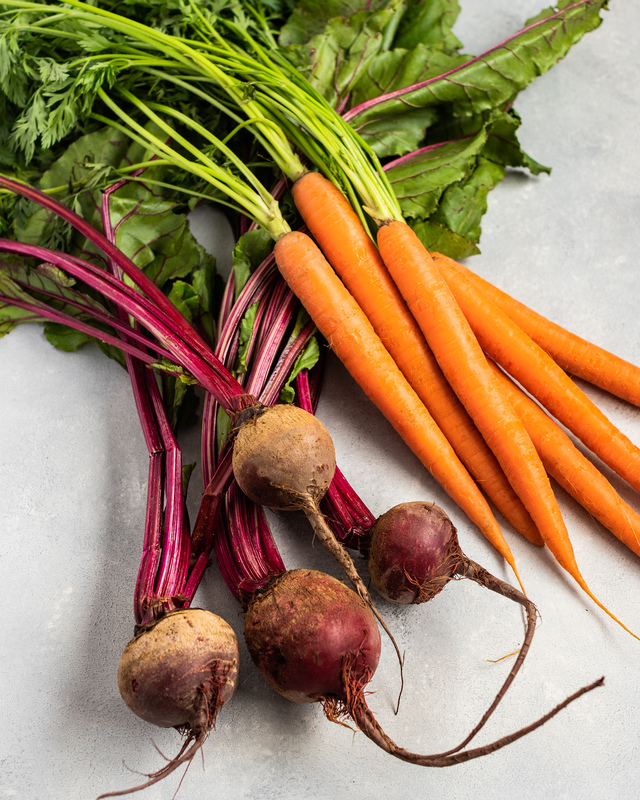 Roasting beets and carrots are super simple and require minimal seasoning: salt and pepper! 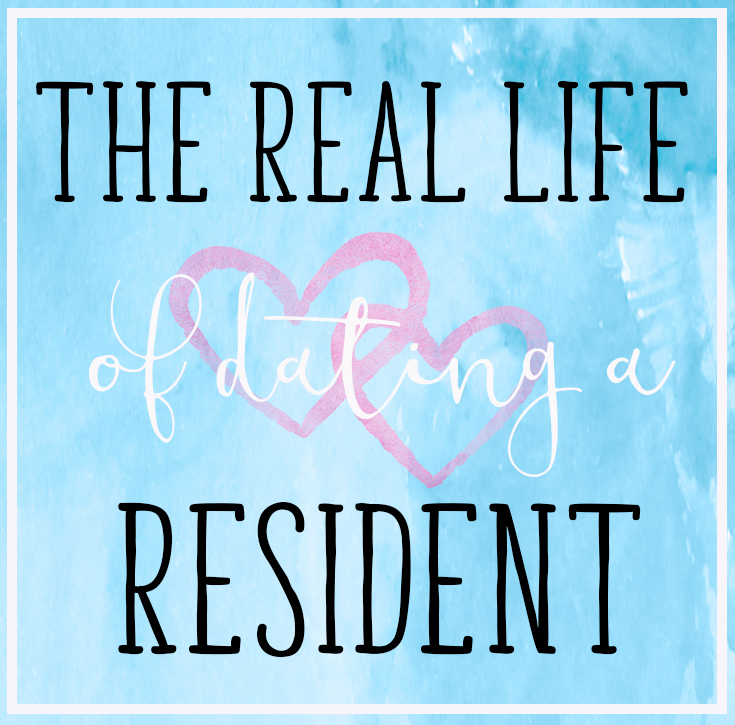 The only difficult part is cleaning, peeling, and chopping them, but once you have tried roasted beets and carrots, you’ll forget about the prep work. The dressing is slightly tangy and nutty and packed with nutrients. The base is avocados, red wine vinegar, olive oil, and hemp hearts! 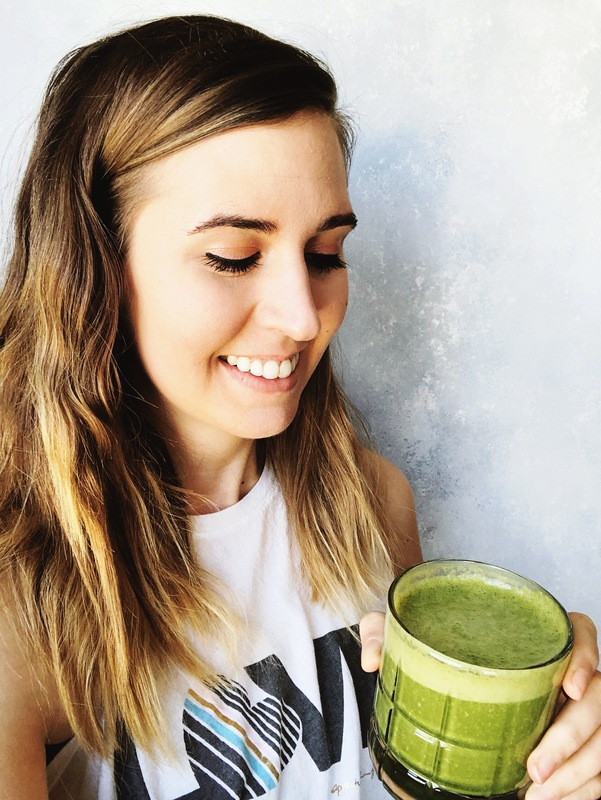 Hemp hearts give it the mildly nutty flavor and a ton of health benefits. The dressing is super flavorful and pairs very nicely with chili-spiced food: chili-spiced chickpeas, tofu, salmon or chicken. I highly recommend adding a protein source to make this salad a main meal! Don’t forget to add some toasted almonds for crunch, green onions, and feta cheese or plant-based feta for additional flavor! I hope you all enjoy this tasty salad! If you try this recipe, share feedback on what you think! Leave a comment below and rate it, and don’t forget to capture a photo and tag #eatlovenamaste on Instagram! 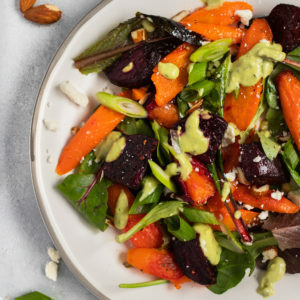 This Roasted Beet & Carrot Salad with Avocado Dressing is super simple and has a ton of flavor! Perfect as is, or add a protein source to make it a main meal! 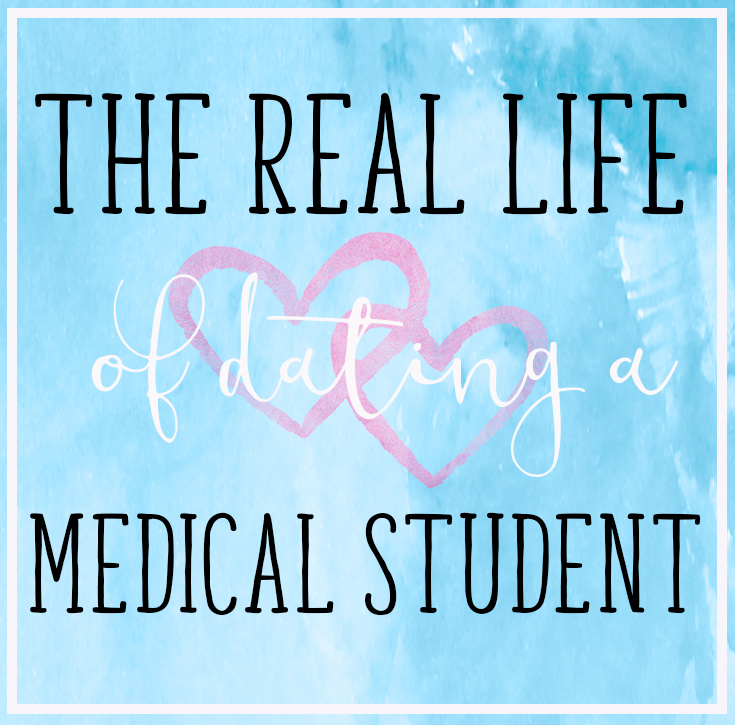 Preheat oven to 435 degrees Fahrenheit and line a baking sheet with foil. Clean and peel the carrots and beets. Cut in bite-size pieces and place on the baking sheet. Toss with avocado oil, and salt and pepper. Cover with foil and bake for 25 minutes. Remove foil, toss ingredients with a spoon, and continue roasting for an additional 10-15 minutes, or until fork-tender. 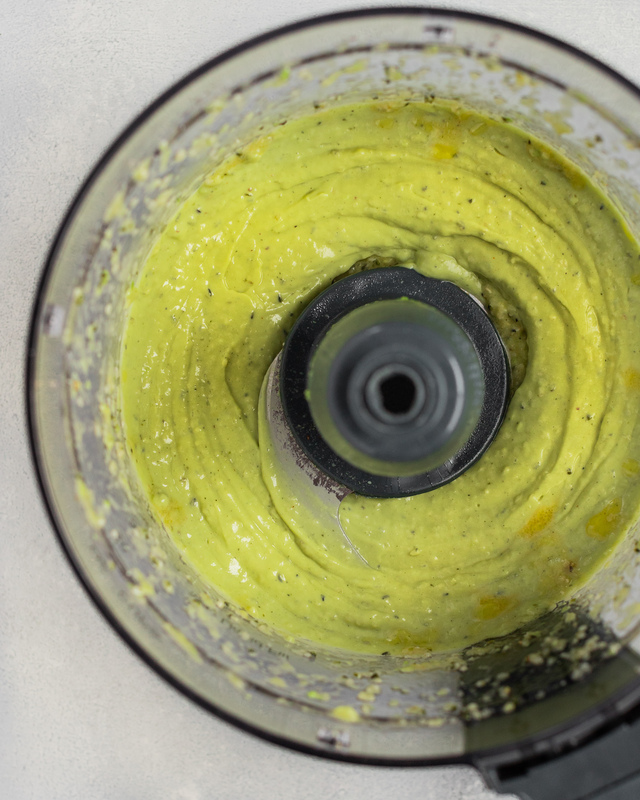 Make Avocado & Hemp Seed Dressing by adding all ingredients to a blender. Taste and add more salt and pepper, if needed. Build the salad by placing greens down, adding the roasted vegetables, and optional toppings. Add dressing on top or serve on the side. * If the Avocado & Hemp Seed Dressing is too vinegar, add a pinch of salt. Taste and determine if it needs more, or just perfect. If you want a thinner sauce, add a tablespoon of water at a time.